Ms. DiRenzo is an associate attorney at Johnson & Klein whose practice focuses on civil-rights litigation. Ms. DiRenzo graduated in the top 2% of her class (Order of the Coif) at the University of Denver Sturm College of Law, which she attended on a full-ride, public-interest scholarship as a Chancellor Scholar. She participated in the law school’s prestigious clinical program, where she served as a student attorney in the Civil Rights Clinic, representing state and federal prisoners in cases raising constitutional claims under the First, Fifth, Eighth, and Fourteenth Amendments. 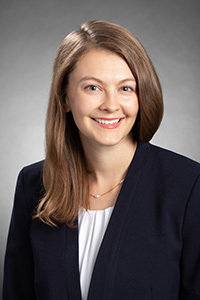 Ms. DiRenzo served on the editorial board of the Denver Law Review and helped implement two new programs at the law school—the Pledge for the Public Good and the Public Good Distinction, which help encourage and support students using their law degrees to advance the public good. Ms. DiRenzo served as a law clerk to Justice Brian D. Boatright on the Colorado Supreme Court. The Claire Davis School Safety Act: Why Threat Assessments in Schools Will Not Help Colorado, 93 Den. L. Rev. 719 (2016). Ms. DiRenzo helps empower young people by educating them on their constitutional rights as a volunteer for “Learn Your Rights in Colorado.” Ms. DiRenzo has previously volunteered with the Colorado Juvenile Defender Center and Aurora Public Schools.